This study is part of a research project by PPPLab on the role of the Public P in PPPs. This research aims to provide a better understanding of the Public P in terms of incentives, roles, challenges, and partnership practices to support more effective partnering with the public sector in PPPs. The “Food security via vertical integration of a new Kenyan potato chain” PPP was launched in 2015 as part of the second FDOV call by the Netherlands Enterprise Agency to enhance food security in Kenya though the development of the Kenyan agribusiness sector. The PPP is part of a larger strategy of developing the potato industry in the country to alleviate Kenya’s dependency on maize as a staple food. However, agricultural yields of potato farming are low in Kenya, and the industry is not well developed. The PPP addresses these issues by engaging local multipliers, service centers, distributors, independent farmers, commercial villages, and large scale farmers in a collaborative approach to improve income for smallholder farmers, and in particular for women. The main public partners in the PPP are the Dutch Ministry of Foreign Affairs, through its embassy; the Kenyan Ministry of Agriculture, Livestock, and Fisheries; the Kenya Plant Health Inspectorate Service; and the local county governments. The main motivation for partnering is the opportunity to combine the expertise of the public sector with the innovative capacity of the private sector to come up with new solutions for food security issues and develop the agribusiness sector in Kenya. In order to achieve this objective, the public partners all play their part. Besides a supplying role in providing funds for the partnership through the FDOV instrument, the Dutch public P plays a crucial role facilitating and convening the partnership, organizing meetings, and providing training opportunities for the Kenyan public P, which is in turn responsible for enabling and embedding the partnership and carrying out coordination and promotion activities. In addition to opportunities, partnering with the public P also brings some challenges and risks to the fore. In this PPP, one of the most crucial of these is the lack of capacity on the side of KEPHIS, which leads to delays in the project. Also, the apparent difference in the interest and approach of the public with the private sector is a burden on the partnering process. Whereas the Kenyan public sector, and KEPHIS in particular, wants to minimize risk by adhering to strict certification protocols, the private sector wants to maximize profits by strengthening the business case. Finally, the legal and political context has proven to be challenging – in particular, the implementation of devolution and the upcoming elections in Kenya, which may prove to have ramifications for the continuity of standing political agreements, staff involvement, and policy priorities. To deal with these challenges and mitigate risks, the PPP has developed a number of practices focusing on capacity development, agility in navigating the political context, and collaborative policy design. 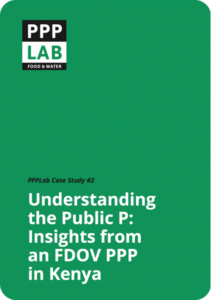 The main findings of this study are that, in order to work effectively with the Public P in a PPP, it is important to employ a repertoire of strategies for engagement, to be able to navigate the local political context, and to be willing to invest in the development of partnering capacities and trust within the PPP. Most importantly, effective partnering in PPPs requires making strategic choices on the why, how, and what of working together with the Public P.